Twitter, the revolutionary micro-blogging site, has seen a surge in celebrity sponsored tweets. The site has strayed from the traditional form of advertisements seen on other social networking sites, like Facebook. However, due to market demands, they have found a sly way to please sponsors. Sponsored tweets is a system that allows advertisers and tweeters to mutually select one another. Anyone can sign up for the service. For more exclusive sponsor opportunities, companies are turning to celebrities. Kim Kardashian allegedly gets paid some cold hard cash to mention advertisers and their products to her 2 million Twitter followers. Advertising company Ad.ly have used her Twitter, along with Lauren Conrad and Dr. Drew's. 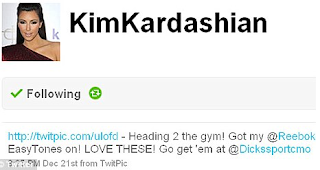 Some of Kardashian's most common sponsored tweets are for Reebok EasyTone and Carl Jr, both of which she represents in ad and television campaigns. Kim sure knows how to show her family the money.